The Sandman (1988) #1 is not a perfect comic, but it’s an excellent one. The issue tracks Dream from his imprisonment in 1916 through his reemergence in 1988. He does very little in those years, but the world changes around him even as some people sleep the entire time away and others never have a true dream. While Dream is imprisoned and they dream, his tools are stolen and dispersed around the world and his original captor passes away. Gaiman’s script here is impossibly tight, filled with little details in every inch of narration. Sam Kieth’s art is memorable but a bit haggard at points – this is early in his career, still a few years before defining work on Ghost Rider or Maxx. 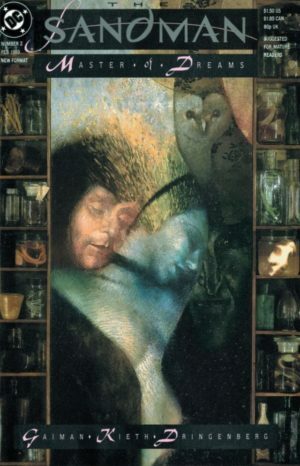 Some of Kieth’s long-faced, dropping facial work detracts a bit from the otherwise stellar issue – it’s probably not what you expected from Sandman based on the covers, later interiors, or Overture. Today’s episode of Crushing Comics will be coming to you 12 hours later than usual, and it will be something very different than what I’ve been doing since the show debuted in November. 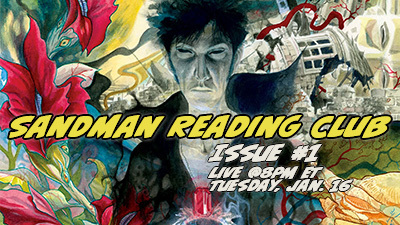 Tonight, I’ll be joined by my friend the illustrious FanGirl on a live broadcast where we will discuss and dissect Neil Gaiman’s classic series The Sandman, starting from the first issue! Want to watch this all-new, all-different pilot episode? Tune in tonight at 8pm ET / 5pm PT / 2pm New Zealand time.